PRINCE2 2009. Risk part 11. The session should be facilitated by someone who is able to use a range of identification techniques, such as those listed in the ‘Risk identification techniques’ example below. Risks are driven by uncertainty, so one of the most effective ways to reduce uncertainty is to review similar previous projects to see what threats and opportunities affected them. These are in-house lists of risks that have either been identified or have occurred on previous similar projects. Risk checklists are useful aids to ensure that risks identified on previous projects are not overlooked. These are publicly available lists that categorize risks into types or areas and are normally relevant to a wide range of projects. Risk prompt lists are useful aids to help stimulate thinking about sources of risk in the widest context. This enables group thinking, which can be more productive than individual thinking. However, it is important to avoid criticism during the brainstorm as this can stop people contributing. In addition to identifying risks, brainstorming can also be used to understand the stakeholders’ views of the risks identified. This is a hierarchical decomposition of the project environment assembled to illustrate potential sources of risk. Each descending level represents an increasingly detailed definition of sources of risk to the project. The structure acts as a prompt and an aid to support the project management team in thinking through the potential sources of risk to the objectives. There are numerous ways to break down risk and it may be useful to do more than one list. For example, a risk breakdown structure could be broken down by PESTLE (political, economical, sociological, technological, legal/legislative, environmental), product breakdown structure, stage, benefits/objectives etc. The diagram shows a risk breakdown structure relating to financial risk. These structures will help to identify appropriate risk owners to develop responses. An important aspect of identifying risks is being able to provide a clear and unambiguous expression of each one. This should describe the impact(s) that the risk would have on the project objectives should the risk materialize. 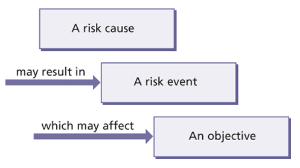 The cause, event and effect relationship is shown in the diagram. Because the weather has been particularly mild this winter (risk cause), there is an opportunity that fewer people will be hospitalized with influenza (risk event), which will mean that there will be less disruption to planned routine operations (risk effect).